Welcome to the show, the travelling ghetto. Years of breathing the souls of rotted minds has created a bad case of "Ghetto Insanity." As you walk the streets, stared at as if you were a freak show, less than human, an ogre walking the streets paved with gold, you'll begin to understand. If those of the ghetto are nothing more than carnival exhibits to the upper class, then let's give them the show they deserve! No more hearing of this show because it can now be witnessed in your own front yard. A travelling mass of carnage. The same carnage witnessed on a daily basis in the ghetto can be yours to witness, feel, and suffer through. No longer killing one another, but killing those who heartlessly ignored our relentless pleas for help. The day has come...the time of reckoning. Who will perish in dreaded Hell and who's soul will be content within the pleasures of Heaven? Looking past the words spoken with a wicked tongue and the evil deeds done within one's life..looking into the consciousness of man. What is the real evil that seems to plague mankind? Who are the real demons that walk this earth? Is it those whose minds have become devious because of a lifetime spent trapped in a caged hell, or is it those who invented this caged hell years ago and have done nothing to help destroy it? Who's guilty? Frankenstein, or the doctor who created it? The sword, or the man who has slain with it? Which is the real evil -- the man who kills another for food, or the man who does not share his food to prevent the killing? While you sit in judgment of a criminal, you may very well be the one who's guilty of greed, deception, and hatred. Time flows like a dark horde, consuming all in its path. Man lives his life in the blink of an eye. Just as day becomes night, all life fades into death. In death, each person will be judged for his deeds performed while alive. There are the few who walk the path of greed, their souls host to demons. Time slows near each person's end, as those whose deeds were evil grasp onto life as long as they can. Though they don't know what awaits them in the afterlife, they do know for them it is a horror beyond words. Time stops in this world, as the heart becomes still and the soul leaves the body. Time is eternal and even in death it is but a new beginning. For you see, when you step into death, your soul steps upon the floor of a dark chamber and you look to see it empty, except for a strange looking box on an old wooden table. On the front of the box, you will see a question mark faded with time and a twisted crank handle on its side. As you turn the handle, a sharp melodic tune will fill the air with a deafening noise of terror. The surprise comes when the music stops and the top of the box pops open and its contents are revealed. For the few, they will see a vision of God granting them eternal peace, with a wash of golden light warming their soul. The rest will see an image of Hell, spawned and formed from their own evil; a reflection of their soul with fog seeping from the box, stripping their sanity. What will be in store for you is the mystery, but if you take a look within yourself, you will find the answer. For now, you still have time to change the outcome of the mighty Riddle Box. From deep within the Netherworld of shadow walkers comes yet another exhibit of the Dark Carnival. He is the master of the art of using magic without magic... He is a Necromancer... the craft of using magic through the dead. Dead meaning both physically and mentally. This spectacle shall be witnessed only by those who are meant to see it. Look deep inside of your soul and ask yourself... Do you hold a ticket to witness the show? The answer lies within yourself. He is the fourth to rise. He feeds upon one's own greed. He is powered by one's own jealousy, lust, and temptation. To envision yourself with something that rightfully does not belong to you... that is the illusion cast by him. To act upon this vision and seek it out at the expense of another... that is the magic cast by him. Continuos dreamers of profit at the cost of another are pledfed and haunted by his wizardry. Others are content and satisfied with what they can achieve by themselves and have not the urge to tamper with another's well being for quick gain. They see him only as a hoax and see no illusions or magic by he. It is simple... He is you. His illusions are your evil thoughts. Your evil acts are his magic - yesterday, now, and forever. You and he are the fourth to rise... You and he are the master of Necromancy... You are the dead and him the magic. 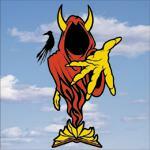 Together, you and he are The Great Milenko. His evil influence flows from the city streets like red molten ooze, filling every alley and gutter. There are those who are burnt by it, like the charred remains of a napalm strike. He moves in silence, yet with his heat comes ear-shattering screams as the masses are scorched in his choking smoke of corruption. His fire consumes like a lethal injection flowing through the veins of a dying convict. Hosts of small red ants crawl in the wake of his presence, biting and stinging flesh. His holocaust fills the woods of hope and prosperity like a wave of hungry piranhas on a newborn lamb. He goes by many names, but for now let it be spoken like the force of a fireball bursting into a crowd. He's Jack, pure and simple... Jack Jeckel. His glow of compassion kindles the heart, like a campfire on a cold winter's eve. His embers burn eternally, spreading the flame of mercy like a warm blanket over the shoulders of a vagabond. His kindness is fueled by sympathy for human suffering, but his inferno of righteous cause, incinerates creatures of sin to ash. The torch of his salvation guides wanderers in the dark abyss to freedom. Its flaring sparks float on the winds of change, like soaring birds recently freed from a dreary cage. Laughter explodes forth from the essence of his being, radiating the land with childish joy. He has many names, but for now let it be spoken like melodic music drifting through the air. He's Jake, true indeed... Jake Jeckel. Emerging from the Dark Carnival like phantom smoke drifting into the minds of men, they are the Amazing Jeckel Brothers. A chaotic duo of juggling masters, Jack "the sinister" and Jake "the just" juggle the sins of mortal men. The price of admission to their show is a mere human soul. When death creeps 'round and life decays, the departed spirit will begin its journey. A vision of a candle will begin to form like a distant dream with billowing smoke rising from its eternal flame. In this thick haze the deceased will begin to see an image of Jake and Jack Jeckel juggling red balls between themselves. Each ball soaked in fresh blood and pulsating like an erratic living heart. For every sin committed in a mortal's life another ball is added to their unearthly performance and the harder it becomes. The deceased will witness sinister Jack throwing Jake curves in a vile attempt to see a ball drop. For if they should fumble in their act, a pit of infinite evil shall open beneath the feet of the viewer and cast the soul into an eternity of pain and suffering. Success on the other hand, opens the gates of Shangri-La and grants one ascension into pure enlightenment and peace. Jack and Jake Jeckel rest in all of us for they are they very fabric of our being conscience and soul. There is no escape from their Juggling act because there is no way to escape from ourselves. Only in death will we realize this as we twist and spin to the other side? 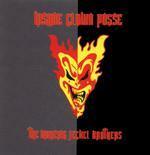 A presence can be felt by those who have followed the epic saga as told by the Insane Clown Posse. It is a presence that is synonymous with the crumbling of time itself. Thus emerges a being so powerful that he can exist between both the land of the living, and that of the dead. He goes by many names but is known to the living only as the Wraith. He walks upon worlds forgotten, and descends from heavens; fade into gray to witness the death of all mortal things, so that he may guide the departed upon the path that they have chosen...Shangri-La. Here is the story of the path to Shangri-La, the 6th Jokers Card. Only now will we truly understand the meaning of the saga, for this saga all along, each Jokers Card, is actually none other than... The echo of our lives. Cotton Candy & Popsicles w/?? ?